Good morning and Happy Monday all!!! I hope everyone had a fabulous weekend? We didn't have any major plans, so we just chilled out all weekend. It was pretty windy, but I didn't let that stand in the way of grilling out both Saturday and Sunday. Weekends are my favorite time to throw something on the grill, so I took full advantage of both days. Saturday we had these amazing Lemon Pepper Grillin Chops pictured above. I say amazing because the marinade was out of this world good and the pork chops were so tender. I've had this recipe on my to grill list for quite some time. So when Walmart asked me to share a recipe that uses olive oil these pork chops immediately came to mind. I have been trying to use healthier fats in our diets and remove all the bad ones as best I can. It's a slow process, but I'm getting better. Currently the only fats that I have in my kitchen are coconut oil, olive oil and butter. I use olive oil or coconut oil for for pan frying and sauteing as well as olive oil when I roast or grill vegetables. I also use olive oil for marinades, dressings and vinaigrette's that call for regular oil. I do however still use butter for baking, but I'm getting better at incorporating coconut oil into my baking instead. The health benefits for olive oil are so positive. According to The Olive Oil Times, the main type of fat found in all varieties of olive oil is monounsaturated fatty acids and is actually considered a healthy dietary fat. Olive Oil is known as one of the best sources of monounsaturated fatty acids, a type of fat that has been shown to improve blood cholesterol levels. Olive oil lowers bad LDL cholesterol and reduces your risk of developing heart disease.Besides cholesterol levels, olive oil can be beneficial to your health in so many ways. Olive oil boosts the immune system and helps to protect against viruses. Olive oil has also been found to be effective in fighting against diseases such as Cancer, Heart Disease, High Blood Pressure, Oxidative Stress, Diabetes, Brain Health, Obesity, Rheumatoid Arthritis, Osteoporosis and helps prevent Skin Cancer. That covers a lot of health issues, so why not use olive oil. My olive oil of choice is extra virgin olive oil - cold pressed because it has the best health benefits. Extra Virgin Olive Oil is produced from the first pressing of olives -- making it the most pure and least acidic. I buy the Great Value or Kirkland's Signature Extra Virgin Olive oil because those are the most reasonably priced for me. In the marinade above I used the Great Value Extra Virgin Olive Oil, garlic, lemon pepper, salt and Worcestershire sauce. That's it just five ingredients to make this tasty marinade. Thick cut pork chops are such a nice change from our typical grilled steak. Next time I will be trying my hand at some Grilled Hawaiian Pork Chops. Goodness I can't wait. Rinse the pork chops under running water and pat dry, set aside. In a large bowl or large zip lock bag combine the olive oil, garlic, salt, lemon pepper and Worcestershire sauce to create the marinade. Pour the marinade over the chops making sure to coat the pork chops well. Cover and refrigerate for at least one hour or up to 3 hours is best. Make sure to turn the pork chops over half way to marinade both sides. Remove the chops from the marinade and set the marinade aside. Grill the pork chops over medium coals for 25 - 30 minutes, or until no pink remains, turning several times. Baste the pork chops with additional marinade the last 10 - 15 minutes of cooking. This post is part of a campaign I'm participating in with the Walmart Moms Program. I have been compensated for my time and efforts in creating this post. Participation in this program is voluntary and the opinion's stated above are entirely my own. I haven't had a bitter taste from cooking with olive oil. Maybe it's the brand you are using. Olive oil is also MUCH better for you than sunflower or soybean oil. Sometimes it can be tart but generally extra virgin olive oil is more subtle than regular olive oil. That is what I was thinking Val. I use extra virgin olive oil and haven't had the issue of it being bitter at all. That is why I mentioned it might be the brand or type of olive oil they bought. 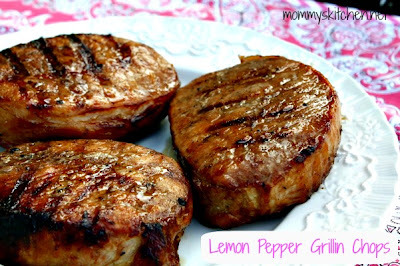 These are going on our menu this week...I picked up some nice pork chops from our butcher and I love homemade marinades...win-win! If you use an oven bag, do you still turn chops and baste while cooking?